Okay, uhm, this is actually going to be a weird post. Everyone who knows me, can admit I’m not a big Apple lover. I don’t hate it, I really like the beautiful designs, a great UI, a beautiful phone, but… it’s Apple, it’s Steve Jobs, it’s the blind making religion that makes lots of people unrealistic. It’s the overall assumption that it’s better than everything else. That’s why I’ll never buy Apple products! Besides that, I’m born and raised in the Microsoft dev shed, so I really dig programming C#, which is, in my opinion, absolutely, the best language available. Linq, need I say more? My latest program however is an Android application, but programming Android is done in Java(Java is quit similar to C# syntax) and programming Android is really fun! The most read post on my blog is Android for gradients and I’ve received some mail about writing a post about getting the Apple look on Android(no! no! no! no!). So, based upon my respect for my readers, here’s….. this is hard….. a kind of Apple look for Android. It’s using pure xml and 9 patch images for a better look. Apple is using some really subtle effects for text and shadows which is not possible using xml drawables only. As you can see there is just a couple of includes here, representing different toolbars. All basic Android layout stuff. The buttons are using drawable and styles to minimize code. Just a basic blue button, using the apple colors. I’ve created a black variant also. As you can see, a lot of subtle details are missing but it’s getting close. It’s useable as a great button and toolbar look. If you want it to look more like Apple, you to use 9-path images. This is just a sort of a brackground image with small black lines around the background. This might look kind of weird but is very powerfull. Those lines define the “padding” inside the button and the regions of the background which should be stretched. The advantage of this technique is of course using png files, so no limitations. You can create every effect possible. Creating real Apple buttons is made easy thanks to 9-patch images. A basis blue button. Take a look at the example, third row. The goal of this post is not getting the Apple look on the Android phone. Personally I really like the matte look, take a look at my latest Android app Analytix for Google Analytix. No gradients there, just matte colors. I wanted to show you how to use 9-patch images in combination with xml drawables to create a nice looking kind of toolbar using Apple design as an example. You can use the images and code without any restrictions. The gradients will be patented by Apple of course, using patented iHex colors, I don’t know. Use your own images, it better and safer. Stay away from those fanatics! and drugs of course! buttons Look Really Cool…Blue button Looks Greate…good ..!..Keep it up..
Can you help me place these files? Its really cool and awesome best starting place for getting best designs. And my search for learning about good ends here. That is pretty darn close Folkert! thank you for this example activity it helped me a lot. 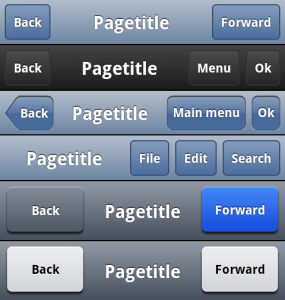 I interested in designing, can you send me the full source code and image button. Really slick. Do you have the color values or the bar_black.xml available? May I know the color you use for grey button drawable? Could you send me the files or put it to download? Great blog. I’m learning to develop in android and your button info and examples helped me out a lot.